In trying to rescue its banking system, Cyprus struggles to find a plan B after rejecting the deposits tax suggested last weekend. However, a Russian rescue is not on the table yet. Any such rescue could, according to press speculation, require a compromise on the newly found gas reserves near the southern shores. This meant that worried forex investors headed to the exit door yesterday, pushing the euro 34¢ down to $1.2898. Amid a supportive statement for the global markets from the Federal Reserve, Cyprus' fate is yet to unfold as the country seeks financial aid from Russia. With the Cypriot banks reportedly staying closed for the rest of this week, or until a deal is reached, it's really anybody's guess as to how the situation will end. Nonetheless, going by the principle that no news is better than bad news, the euro found enough strength to gain 52 points against the dollar yesterday, closing at $1.2934. Unfortunately, this morning's poor German PMI data has seen the single currency make a 180 degree turn on the forex markets and so the EUR/USD pair is now trading lower at $1.2890. Shocking as it might seem for Brussels, the Cypriot parliament voted down the levy on bank deposits, with the country's Finance Minister handing in his resignation as a result. The news sparked fresh concerns that the banking crisis will spread within the wider Eurozone, with a run on Cypriot banks being the next immediate threat. 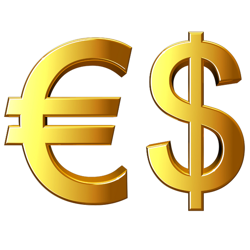 Consequently, the euro resumed its slump versus the dollar, losing 72 points to $1.2883 yesterday. So far this morning, the surprising bounce in equities is leading to a bit of support for the euro as EUR/USD trades at $1.2900 at the time of writing. Although the euro gapped significantly lower than Friday's closing price, the EUR/USD pair then managed to rebound 44 points to $1.2955. The Cyprus story has undoubtedly monopolised the news, with a so called bank deposit tax trying to raise around €6 billion in exchange for financial help from the EU. However, the proposed measures are yet to be adopted by lawmakers, with some mentioning the possibility of changing the format in order to spare small scale savers. Despite a 71 point rebound for the euro-dollar market on Friday, reaching $1.3074, a surprise weekend announcement from Cyprus saw the pair tumble below $1.2900 this morning. It appears that Cyprus has been given €10 billion financial aid by the EU to prevent a meltdown, but has been forced to impose a deposit levy for the rest of the €6 billion needed. The EU Summit started in Brussels yesterday, where leaders were hoping to strike an agreement over the fate of the next bailout candidate. At the same time, the Eurozone employment numbers did not look good, dropping 0.3% against forecasts for a decline of 0.1%. Despite that, the euro rallied 45 points against the dollar, rising to $1.3004, and this morning is a little better at $1.3030. It seems that the $1.3000 level continues to garner a lot of financial spread trading investor interest and is causing a tussle between the bulls and the bears. In forex spread trading, better-than-expected US economic data was undoubtedly the reason behind yesterday's boosted demand for the dollar. With the US economic outlook in arguably the best shape out of the developed players, it was hardly a surprise to see the EUR/USD pair resuming the slump, losing 72 points to $1.2960. This was aided by the fact that Eurozone officials are meeting in Brussels today to discuss a new potential bailout. The euro closed marginally lower against the dollar yesterday, losing 13 points to $1.3032 amid signs that manufacturing in the common area is falling behind the US. FX CFD trading market participants decided to wait on the sidelines until the summit in Brussels on March 14-15 where EU leaders will discuss plans to rescue Cyprus. Even though we saw some weak German trade balance data yesterday, the shared currency rebounded 50 points, with the EUR/USD pair closing at $1.3045. It seems that some bargain hunters considered the region below $1.3000 as a good entry point, particularly given the confidence that the ECB will be there to help. This morning, the $1.3000 level is being tested once again, so all eyes will be on whether it can hold. Normally, we might expect positive US employment data to spur a shift from the dollar into riskier currencies, but this was not the case on Friday. The euro-dollar spread trading market lost 107 points to close at $1.2997. Increasing signs that the US recovery is gaining momentum remains at odds with the Eurozone where unemployment reached a record 11.9% in January. Despite Fitch's Italian credit rating downgrade, the single currency is impressively holding its own this morning, as it trades just back above the $1.3000 level.